Lynne Huffer possesses the hallmarks of a classic overachiever. Almost three decades after completing her master’s and doctorate in just five years, she still moves through academic life at a breakneck pace, with prodigious service, teaching and advising commitments. She’s the dissertation adviser for six graduate students and a committee member for another eight (after advising and serving on as many as 18 committees), along with multiple undergraduate major and honors advisees and research collaborators. That doesn’t include the many non-majors who take her courses and come away with a newfound appreciation for the kind rigor she brings to their studies. 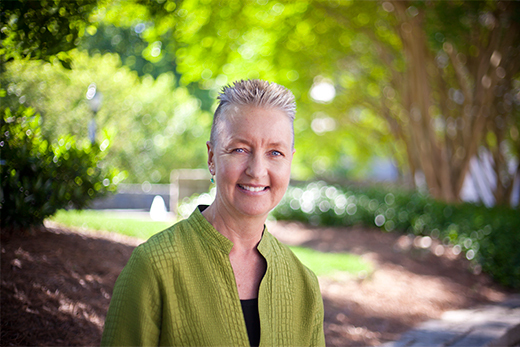 In recognition of her work with students, Huffer, Emory's Samuel Candler Dobbs Professor of Women’s, Gender and Sexuality Studies, is the 2016 recipient of the George P. Cuttino Award for Excellence in Mentoring. Mentoring happens incrementally, she contends, beyond routine classroom encounters but rather in the kind of ongoing engagement with students that allows them to develop over time. She wants her students to acquire three pertinent skills in their time with her: close reading of texts, critical thinking and writing quality. “As a thesis adviser, she encouraged my creative engagement with philosophical texts and helped me struggle through — with great success — some of the most difficult reading and writing I have ever done,” says Alexa Cucopulos, one of Huffer’s honors students. Cucopulos says Huffer tells her students that they don’t just learn from her, they teach her as well. “I think this idea of learning as a process of mutual creation and rethinking is an attitude that really distinguishes her,” she adds. An expert on the French philosopher Michel Foucault, Huffer gets her 21st-century students to think more critically about the role of technology in their lives by requiring them to turn off their devices in class and take notes by hand. “It’s not just that I tell them to do it, I also use Foucault and how he thinks about power to actually show how technology is bound up with how power works," she explains. She uses his ideas around “technologies of the self” to explain to them how the smartphone, social media and even the selfie stick are tools that construct their lives in very particular ways. “What they see as an expression of their freedom may be, from another perspective, a mode of subjection,” Huffer says. When it comes to her graduate students, Huffer has other objectives in mind. They need to be able to stand independently and take responsibility for their own work, she says. “I think Dr. Huffer knew the significance of my project and research questions long before I did,” says graduate student advisee Lauran Whitworth. “She also intuited that it was her job as my adviser to ensure that I finished knowing that my research mattered." Creativity and its companion, curiosity, are themes that run through Huffer’s discourse with her students. She thinks something is lost when students focus too much on career instead of exploration of what interests them. When Huffer was her students’ age, her father, a doctor, wondered about the impractical nature of her academic interests. “I just did what I wanted to do, what made me feel alive, what I felt passionate about, and it all worked out,” she says. Now she advises her students to do the same and to pursue their own intellectual interests, not what others think they should do. As in the best mentors, they see in her a potent example of how full — and fulfilling — their professional lives can be when they love the work that they do.